In this tutorial, you will learn about batch file functions and how functions are written in batch file programs. A function is a single comprehensive unit (self-contained block) containing a block of code that performs a specific task. The function performs the same task when called which avoids the need of rewriting the same code again and again. NOTE: When defining the main program is to ensure that the statement EXIT /B %ERRORLEVEL% is used in the main program to separate the code of the main program from the function. As shown in syntax, a function definition in batch file starts with the declaration of a function with a label. Next is the body of function where we write codes to achieve a certain task. At the end EXIT /B 0 is to ensure successful termination or proper exit of the functions. Like in every other programming language, to use the defined functions, we need to call it in the main program. For this, CALL command is used. Learn more details about all batch file commands here. So, this is how the function is called in batch files. In the case of batch file functions with parameters, a tilde(~) sign is used to access them in the main program along with the positional number of parameter. Similarly, in the case of batch file functions with return values, return values are set in the function using the set command and the tilde(~) character along with the positional number of the return values. 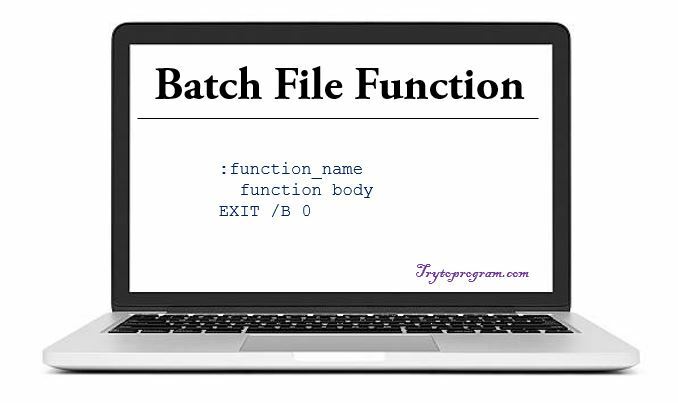 Here is the batch file program to demonstrate the use of the basic function, function with parameters and function with return values. Note that the EXIT /B %ERRORLEVEL% is used to separate the function from the main program and PAUSE is used to hold the screen, else output console will vanish within nanoseconds. Here tilde(~) sign is used to access the parameter’s value followed by the position of the parameter. Hence, ~1 is for accessing first parameter and ~2 for the second. Here SET command along with tilde(~) sign is used to set the return values depending on the position followed by tilde sign.